Introduce yourself to Ignition Casino, an online casino with a large game selection and a diverse promotional calendar. With that in mind, let’s explore some of the best ways for you to cash in both as a new member and on an ongoing basis. All new customers may receive a 200% deposit bonus up to $2,000 for the Ignition Casino, but also another $1,000 deposit bonus for Ignition Poker, and then another $100 tell-a-friend bonus for a total of $3,100! To get started, register your new account at Ignition. Ignition Casino Bitcoin Bonus Code IGBITCOIN200 200% first bitcoin deposit match for up to $2,000 bonus. 25x WR. Ignition Casino Bonus Code Ignition Casino Welcome Bonus 100% first deposit match for up to $1,000 bonus. 25x WR. Ignition Casino Bitcoin Bonus Bitcoin Bonus 25% bonus on every deposit for up to $1,000 bonus. 10x WR. Ignition Poker Ignition Casino Welcome Bonus 100% first deposit match for up to $1,000 bonus. EXPIRED - No Deposit Bonus REV5FREE $5 free, no deposit required. 100x WR. As a new member, you’re entitled to a welcome bonus worth as much as $2,000 if you make your first deposit via Bitcoin. Simply register a new, valid account, and then, make a deposit of at least $20. Visit the Cashier and select Bitcoin or Credit Card as your method of deposit. We recommend using Bitcoin as your payment method because Ignition does not have any transaction fees when making Bitcoin deposits or withdrawals, and your payments will get processed MUCH faster. After selecting Bonus Code, enter the Bitcoin deposit bonus code IGBITCOIN200. If you prefer to deposit via credit card, then select the Ignition Casino Welcome Bonus option. This bonus does not require a specific promo code. The welcome bonus will be deposited into your account almost immediately after your deposit clears. So, if you deposit $50, you’ll start with $100, and you’ll need to deposit $1,000 in order to claim the maximum bonus. Be sure to note the wagering requirements and restrictions below. You should also be aware that Ignition offers a poker bonus in addition to the casino bonus. These don’t interfere with each other. Your main pool of deposited money is used across all Ignition services. Your bonuses are maintained separate. So, if you deposit $100 and get a $100 casino bonus, you’ll also get $100 in poker bonuses. If you don’t play, simply ignore it. It doesn’t matter. If you do play poker, that bonus will be doled out to your account as you earn Poker Points and is as good as cash. You can read our review of Ignition Poker here. Once you’ve made your initial deposit and claimed your welcome bonus, you’ll receive one promo code every Monday for the remainder of your membership. Each code provides you a casino reload bonus of 100 percent of your deposit up to $100. Better yet, you can use the deposit up to seven times each week for up to $700 in all. Note that the playthrough requirement isn’t advertised. It varies from week to week and member to member, and that information will be available on your account page. Most bonuses provided by Ignition Casino have a rollover requirement associated with them. In the case of the casino welcome bonus, that rollover requirement is 25 times. That means that if you deposited $1,000 and claimed the maximum $1,000 welcome bonus, you’d need to play through $50,000 in order to clear the bonus and be able to make a withdrawal. The bonus is cashable, meaning that once you’ve met this wagering requirement, and have any bonus funds left, it is yours to keep and can be cashed out. If you don’t use a bonus fully within six months, all remaining bonus money and any derived winnings are forfeited. If your account reaches zero, then any outstanding wagering requirements are erased. There’s also the matter of game contributions to consider. Slot machines contribute at 100 percent. That means that every $1 wagered on slots goes toward your rollover requirement, but not all games are like that. Other games that are include scratch games and keno. Most table games, on the other hand, only contribute at a rate of 60 percent. Standard blackjack is an exception since it contributes only 30 percent. Video poker also provides 30 percent, and some games give nothing at all. These include baccarat, craps, roulette, single- and double-deck blackjack and sic bo. Each time you deposit money using a credit card or the rapid transfer service, you’ll receive 10 percent of that up to $1,000 as a cash-back bonus. The cool thing about this bonus is that it’s in addition to other bonuses, such as the welcome bonus and the weekly boost. The rollover requirement for this bonus is a 50-times playthrough, and contribution limits do apply. 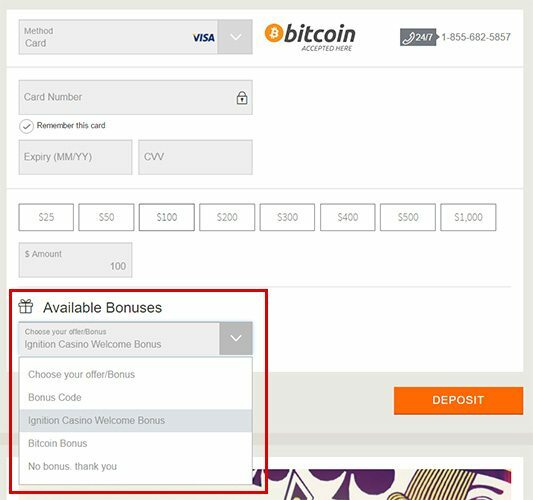 This bonus is similar to the one described above, but you’ll need to deposit via Bitcoin in order to take advantage. Bitcoin is a digital currency and gaining popularity among online gamblers. Furthermore, 25 percent is a substantial amount particularly when you can add that on top of reload bonuses. This bonus can be as large as $1,000 on each deposit, and the playthrough requirement is 50 times. At Ignition Casino, you’re automatically enrolled in the Ignition Rewards program. This is a loyalty program that gives you a number of different ways to unlock the action. Once you make your first deposit, you’ll be assigned the Steel level. This grants you access to reward points, monthly deposit bonuses and other promotions each month. As you reach higher reward point milestones, you’ll graduate to the upper levels of membership. These include Chrome, Bronze, Silver, Gold, Platinum, Titanium and Diamond. Requirements for promotion and maintaining status are evaluated on a three-month-basis, and that makes it relatively easy to get there and stay there. Reward points are earned at the rate of one point per $1 wagered on slots and one point for every $4 wagered on all other games. For every 10 points you earn, you’ll be entered into a drawing for one $1,000 prize and four $500 prizes. 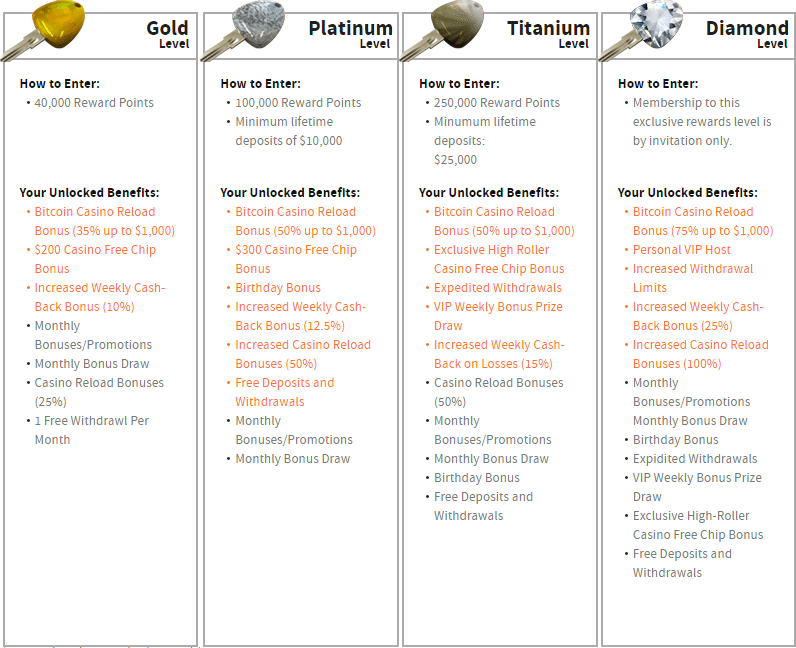 Starting at the Bronze level, you’ll receive a free chip bonus each month, and you’ll be entitled to cash-back bonuses on net losses each week. 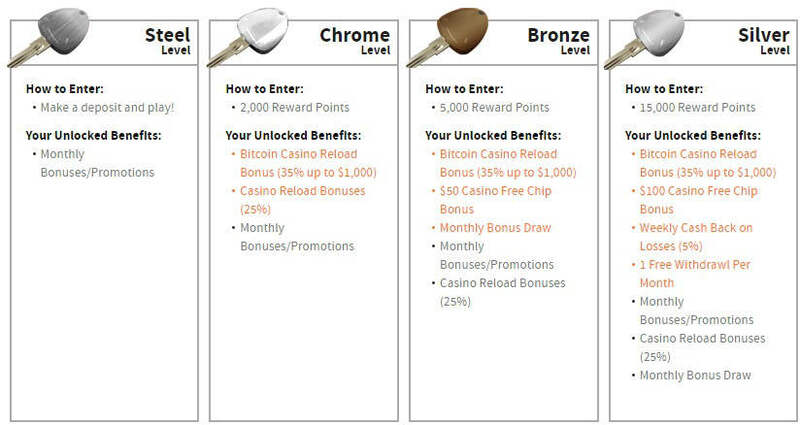 There are also VIP bonuses at the Platinum and above tiers, including a weekly drawing for $1,000. Last but certainly not least is the Tell a Friend promotion, which gives you up to $100 each time you turn a buddy on to Ignition Casino. Just invite a friend! Ignition will give you 200 percent of his or her first deposit as a reward. So, if they deposit $50, you’ll get $100. The rollover requirement on this is 60 times. Sign up to Ignition Casino today! Read up on some additional US casino recommendations at USACasinoBonusCode.com. The best site to find online. Has everything you need to satisfy your needs. Been a member from day 1. Highly recommend!!!!! In all my experience with online casinos this is by far the greatest one of them all. Ignition exceeded all my expectations and then some. Wonder wide variety of games. Payouts are prompt and I guarantee you will keep coming back just as I did. Play now! You can no longer get the $5 free no deposit bonus, was trying to find a way to get that but it's expired everywhere. The best deal and the one I signed up with is the bitcoin bonus code IGBITCOIN200 which is an official code and offers DOUBLE the welcome bonus. 3 reasons to go with this code - first it's double the standard welcome bonus amount and secondly there are no fees w/ bitcoin and thirdly withdrawals/payouts are hassle free (most important reason).